It’s probably no surprise that I contend that life and work are better when you’re having fun. In fact, simplify 101’s tagline is “more fun. more done.” I (firmly) believe that if you’re having fun while you work, you’ll actually be more productive. You’ll get tasks done with ease and enjoy yourself more in the process. That’s why I was thrilled when poppin asked me if I’d like to receive a few of their products to give a test run. It didn’t take long for me to send back an enthusiastic yes. 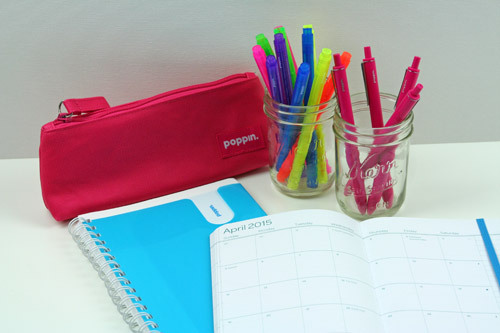 After clicking around the poppin website, seeing their fun and colorful office products, and noticing that their tagline is work happy, I was in! A package of 6 retractable Gel Luxe Pens in pink. I love the way they write and the pop of color on my desk adds a dash of happy to my workday. A package of thin highlighters. You can bet Kailea and I arm wrestled for these. (Okay, not really.) Instead, we cordially decided to split the pack between us. We’ll both get one of each of the 6 colors included in this 12 pack of super happy highlighters. A pink pencil pouch. As much as I want to use this in my purse, Kailea fell in love with it. So she is going to use it for its intended purpose—toting pens, pencils and erasers to her various classes at school. Won’t she feel organized and stylish? Oh yes she will. A weekly/monthly planner in pool blue. This is a great little planner for all of my paper-planner kindred spirits out there. It has a monthly calendar view and a weekly view. On the left side of the weekly view is space for dated tasks or appointments. The right side is lined paper, perfect for a weekly task list or for taking notes. Since I have a planner that I love, I think I’ll use this little gem for a gratitude journal or memory keeping journal. Due to the binding style it’s really easy to write in (a big plus in my book), the paper is nice quality, and the blue printing is a really happy color. All in all, I really like this little planner. Pocket Spiral Notebook in pool blue. As its name suggests, this little notebook has a handy pocket in the front, perfect for stashing notes, receipts, or other loose pieces of paper. Like the planner, the paper in this notebook is pleasant to write on and the spiral binding is small enough that writing in the notebook isn’t cumbersome. (Don’t you hate that when it is? Or am I the only one with this hang-up?) I’m considering using this little notebook for my next bullet journal, just as soon as my current one is filled up. See how you can hardly see the pins in the photo below? That’s why map tacks rock. The happiest file cabinets you’ve ever seen. These file cabinets might cause you to look for an excuse to file…putting an end to that toppling “to file” pile once and for all. Now if that isn’t happy making, what is? 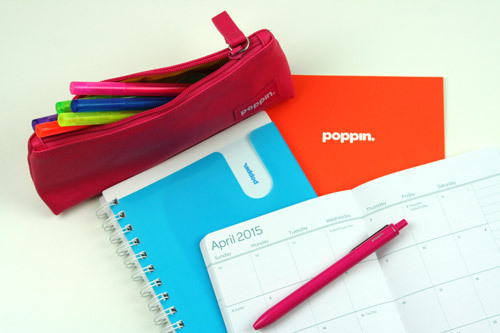 So what do you think of the poppin office products? What’s your favorite color in the line? (I think it’s hard to choose just one, but can you guess my favorite?) Thanks for sharing! Ok these look super cute – and I really like the look of the planner. I love having both a monthly and weekly view and I like the page for notes – that’s what my current planner is like, but this seems smaller in size and would be more manageable to travel in my purse. Also, could you please blog about your bullet journal? 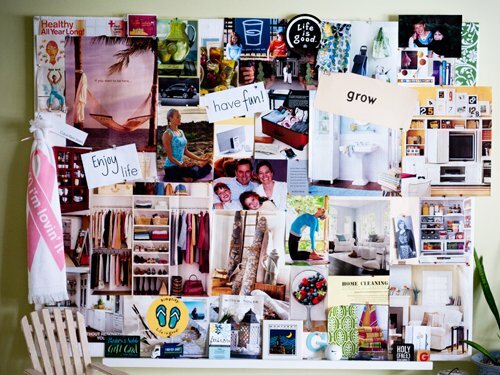 I’ve seen you pin things about it on pinterest but I’d love to hear how someone else is using it – and what you think about it. The planner is really nice. And you’re right about the size. I will put a bullet journal post on my to-do list (in my bullet journal, lol.) Thanks for suggesting it. I LOOOOVE the Poppin line!! Bright Lime is my favorite color. If I could do my entire office in those products, I would. LOVE!!! The Bright Lime is great! Do you have some of their items already? I’d love to know what you’re using and loving. I got the pens. I was disappointed I could not find them with blue ink, but they are lovely!!! I want to go back and get the planner if I can find it. The Staples near me had their stuff for maybe 2 weeks and not it’s all gone. Strange! !